Fiji have fought back to draw 2-2 with New Caledonia in the first leg of their 2018 FIFA World Cup Russia™ Qualifiers - OFC Stage 3 matches. Trailing by two goals after just 25 minutes, Fiji have fought back to draw 2-2 with New Caledonia in the first leg of their 2018 FIFA World Cup Russia™ Qualifiers – OFC Stage 3 matches at Churchill Park in Lautoka this afternoon. Mone Wamowe was behind a pair of impressive strikes to give New Caledonia the lead, receiving a cross then calmly placing the ball in the net in the 13th minute of the game, then timing a diving header perfectly to score at the front post only 11 minutes later. The two goals put pressure on the young Fijian squad, however, they managed it well and began to play a calmer and more structured game in the latter minutes of the second half. Their new approach paid off just before the half time whistle when Saula Waqa scored off his head to close the margin between the two teams as they headed into the changing rooms. Unfortunately, the second half was short-lived for one of Fiji’s playmakers Setareki Hughes, who was carried off the field by stretcher in the 47th minute. Roy Krishna was called from the bench to continue Hughes work up front, and the Wellington Phoenix attacker was quick to deliver, finding the back of the net only four minutes after taking the field. New Caledonia did well to keep their opponents at bay after going down to ten men when Emile Bearune committed a second yellow offence. Both teams fought hard to edge ahead for the remainder of the match but missed opportunities and impressive defending from both sides saw the match wrap at 2-2. Fiji coach Christophe Gamel had mixed feelings about his team’s overall performance, calling the encounter ‘a game of two halves’. Although his young squad was slow to switch on to the game, he was pleased to see them prove their potential with an impressive comeback. “We started the game badly, no intensity and no rhythm. That’s why New Caledonia gained the early lead. I have warned my team before that they are very good players and they come into the game very fast so I was really upset about that,” he said. “In the second half I was very happy because making this kind of comeback requires a big performance and the boys had given everything and respected our game plan for the second half. 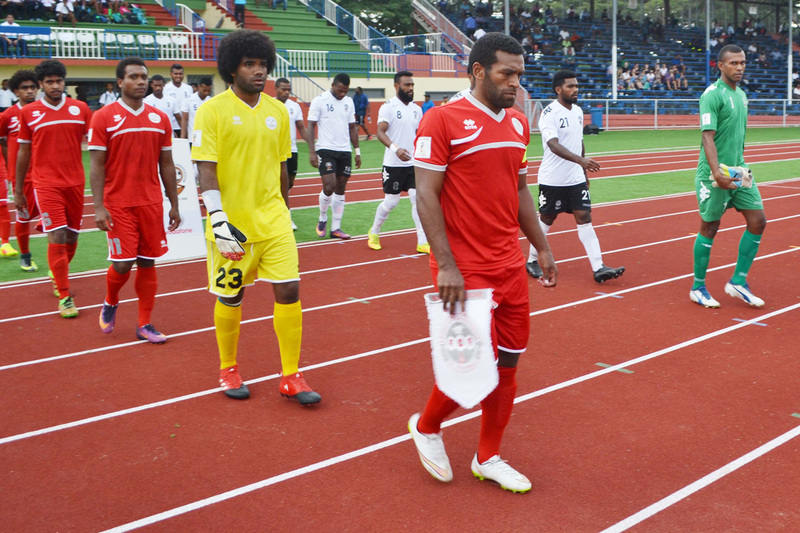 Although New Caledonia coach Thierry Sardo was disappointed to lose the 2-0 lead, he was pleased to see his side stay in the game after losing Bearune – who received two yellow cards – and fending off the determined Fijians for the last 20 minutes. “I was very impressed with the first half an hour. I think we played well for 30 minutes, we went ahead 2-0 and our game was quick,” he said. Sardo acknowledged the impressive improvement of the Fiji side since their last OFC Stage 3 matches against New Zealand, crediting the hard work of Gamel and the commitment of Fiji’s new wave of young players.